1st November 2017, New Delhi: The Prime Minister of India, Narendra Modi, while addressing the nation on 71st Independence Day, made it quite clear that there would be a New India by 2022 - when India marks its 75 years of independence. He said that the New India will be free of corruption which means citizens and businesses will not have to pay bribes to get their work done. 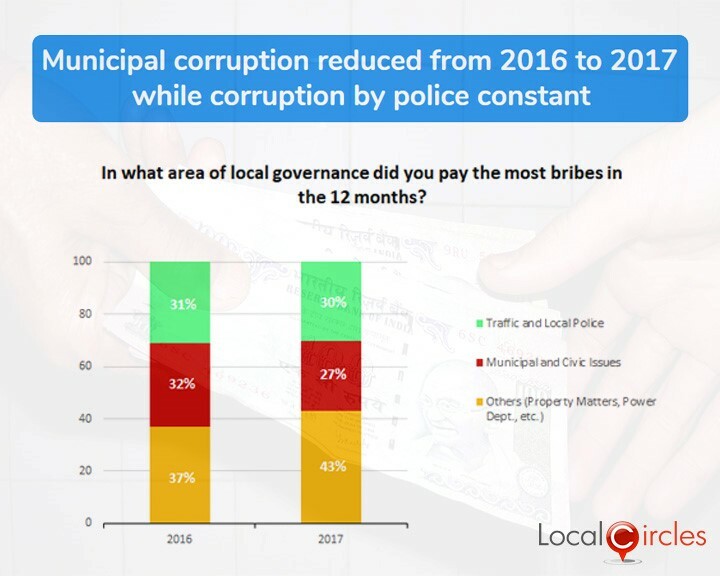 LocalCircles conducted its India Corruption Survey 2017 to ascertain citizen experiences with corruption and bribery in the last 12 months. 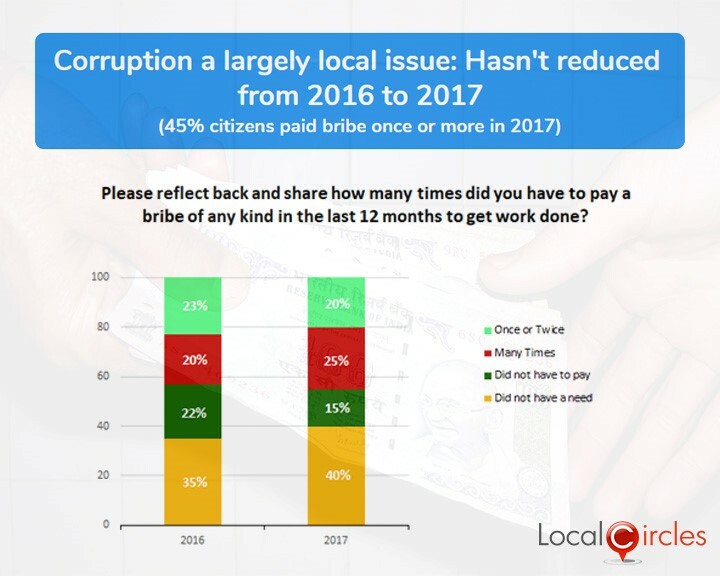 The results of the survey bring out some interesting insights starting with the fact that corruption is largely a local problem with 84% citizens paying a bribe in last one year for a local issue ranging from municipal, police, local tax compliance, property registration, etc. The survey, which received more than 100,000 votes in total and had participants from over 200 cities responding to 8 questions in the national poll. State level polls were also conducted in 12 states to understand which states according to citizens have made progress in reducing corruption and the states were ranked from 1 to 10 for citizen perception of corruption. Uttar Pradesh turned out to be at the top of the list for reducing corruption in the last 1 year and West Bengal was at the bottom of the list. A recent Forbes report rated India as the most corrupt country in the Asia-Pacific region, higher than even countries like Vietnam, Thailand and Myanmar. For a country which is on path of massive development, this piece of statistic could act as a deterrent for many foreign investors. 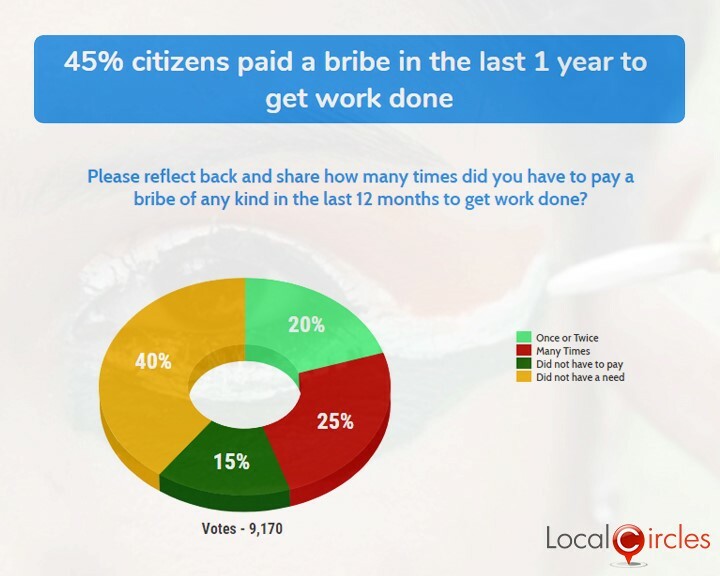 45% citizens in the first poll said they had paid a bribe in the last 1 year to get their work done. 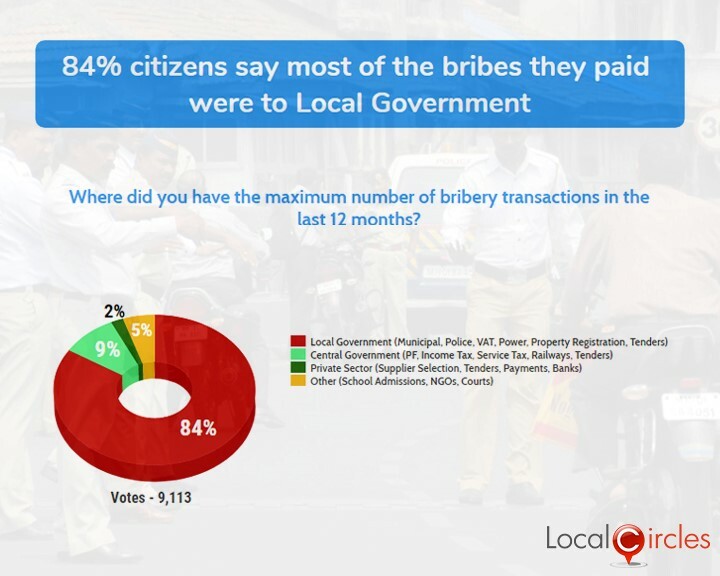 As to where bribes were paid, 84% respondents said that most of the bribes were paid to the local government and state departments, and most bribes were paid to departments like municipal corporation, police, VAT, property, power, property registration etc. 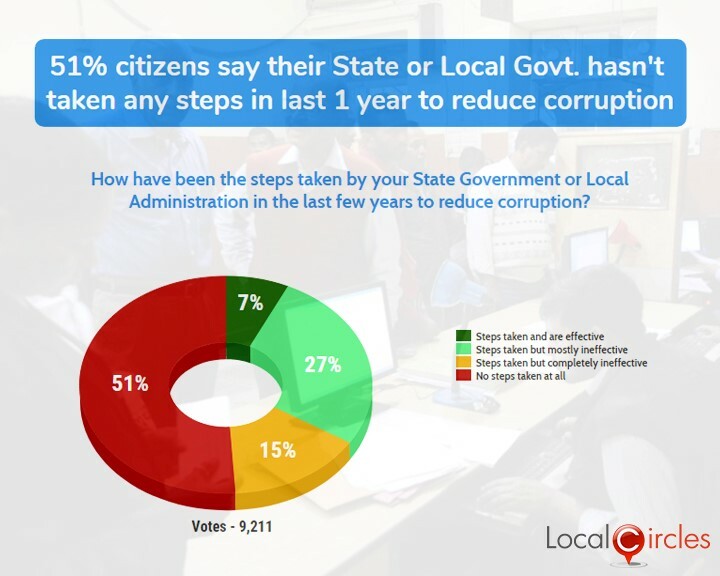 On the question of actions by State Governments, 51% citizens said their local/state government has not taken any steps in the last 1 year to reduce corruption. 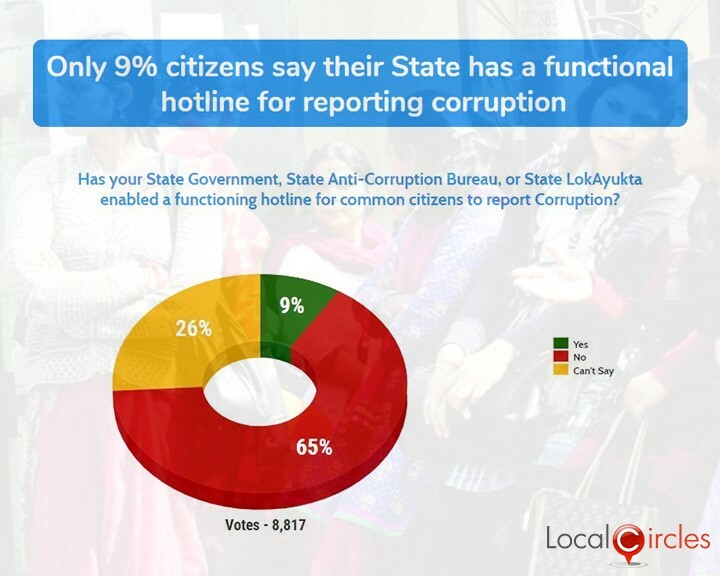 Only 9% citizens said that their state had a functional helpline to report corruption issues. 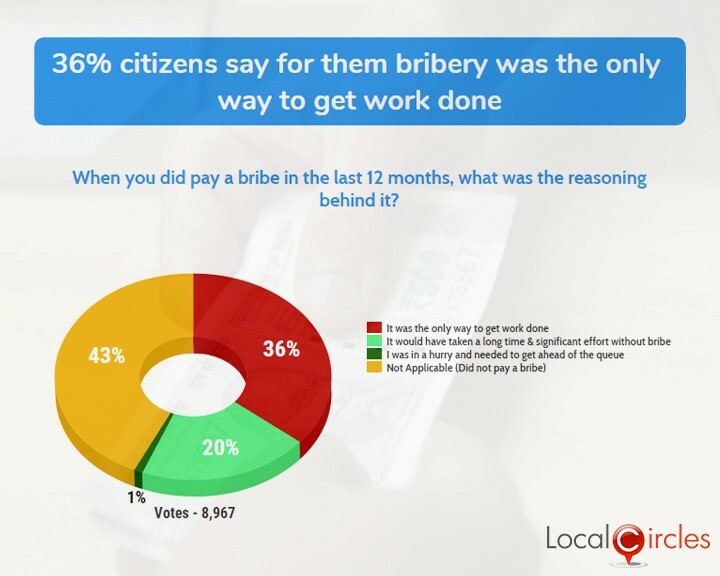 On a question on why did they pay a bribe, 36% citizens said that they were forced and paying a bribe was the only way to get the work done. 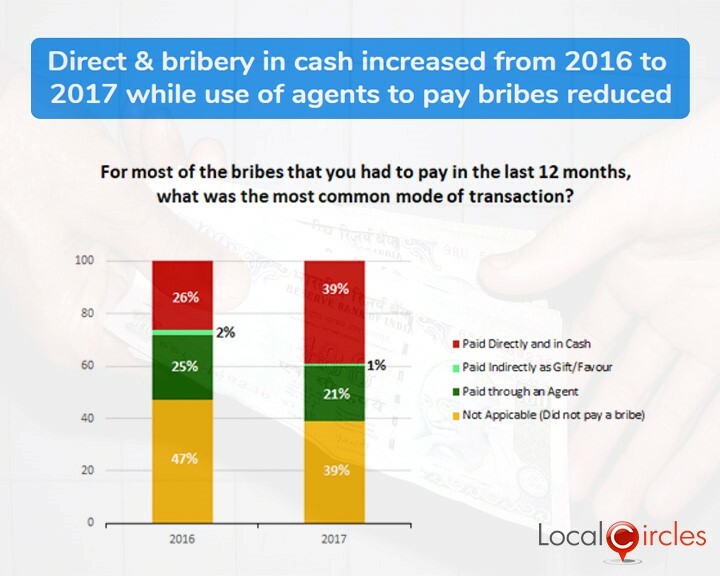 On the question of how the bribery transaction was conducted, the highest percentage of citizens indicated that cash is still the primary mode of bribery transactions. 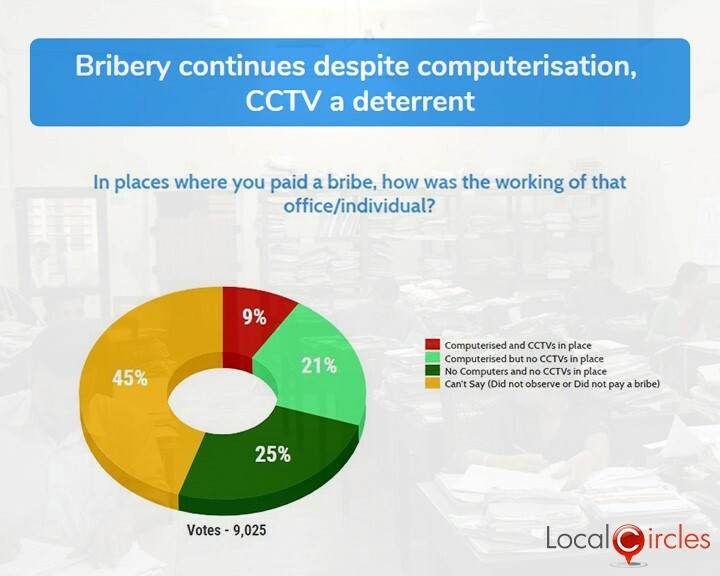 In one of the other polls, 30% citizens said that bribery continues even after the local departments were computerised and majority said CCTVs were one of the deterrents that works against corruption. How many times did you have to pay a bribe of any kind in the last 12 months to get work done? Where did you have the maximum number of bribery transactions in the last 12 months? 9% - Central government departments, i.e. PF, income tax, service tax, railways etc. 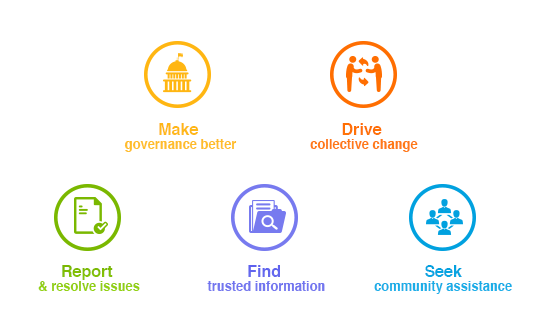 How have been the steps taken by your State Government or Local Administration in the last few years to reduce corruption? 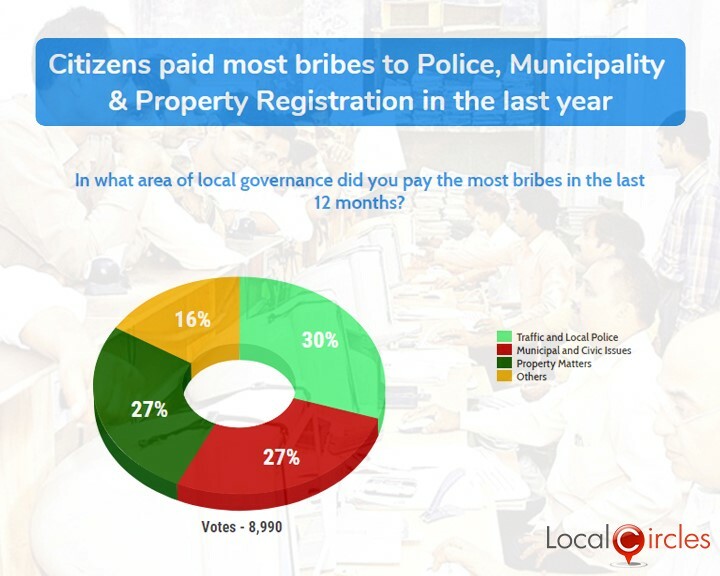 In what area of local governance did you pay the most bribes in the last 12 months? When you did pay a bribe in the last 12 months, what was the reasoning behind it? 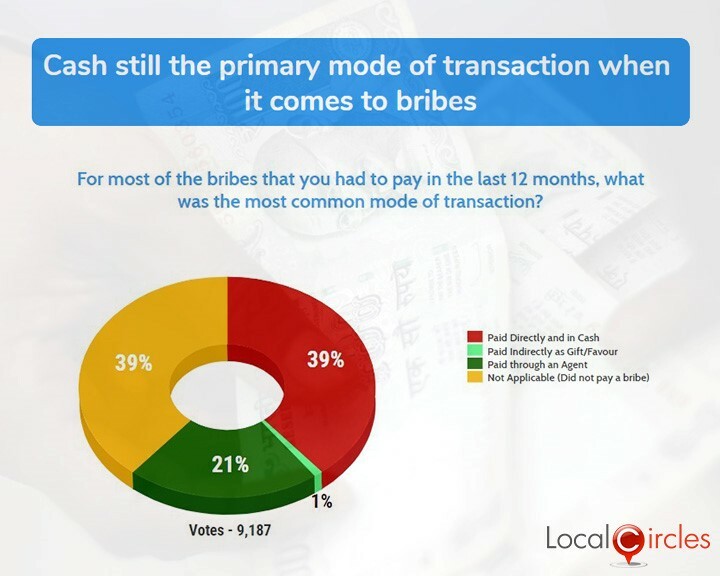 For most of the bribes that you had to pay in the last 12 months, what was the most common mode of transaction? In the place where the bribe was paid, how was the working of the office/individual? Has your State Government, State Anti-Corruption Bureau or State Lokayukta enabled a functioning hotline for common citizens to report corruption? Many citizens on LocalCircles reported that there is no easy way for them to report cases of corruption. They said even if they are able to report a case, no action is ever taken on it. This survey makes it pretty clear that the central government will have to take some harsh steps to reduce the level of corruption in the country and will have to align with the interests of the state government so that ant-corruption policies could be well implemented. The comparison of the 2016 and 2017 India Corruption Surveys reinforced the fact that corruption in largely a local issue and has not reduced. - Police corruption is almost constant at 30% this year compared to 31% last year. As a part of the India Corruption Survey 2017, polls were also conducted in 12 states of India to understand how according to citizens things have changed in the last one year on the corruption front and where some of the bright spots were. These state polls which received more than 35,000 votes also had citizens participating from over 60 cities of India. While there was not a single state where more people believed that corruption had decreased than who believed it had increased, some states did come close. 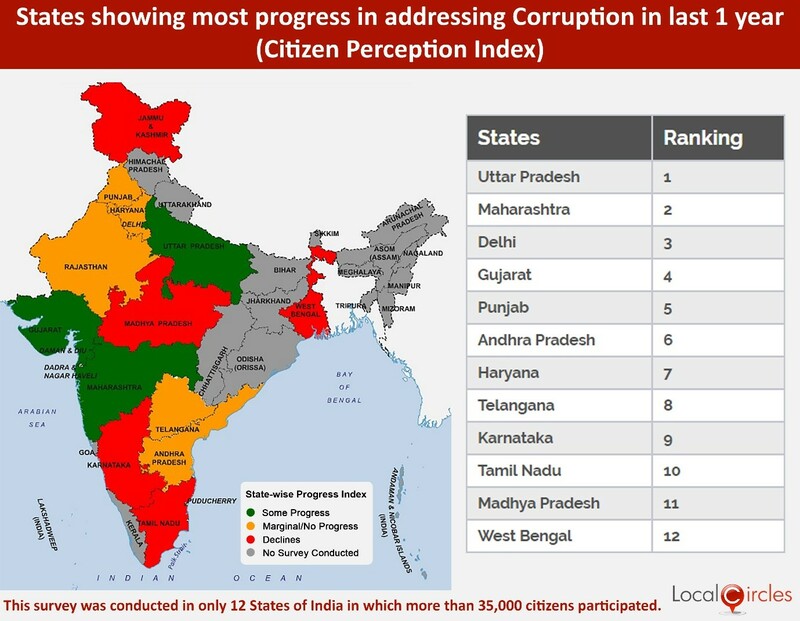 The states were ranked in the order of net decrease in corruption. Uttar Pradesh ranked at the top of the list of states which have been able to reduce corruption with 21% respondents saying that corruption has reduced while 23% saying it has increased. Maharashtra was at number two with 14% saying corruption has reduced and 18% saying it has increased. Delhi was at number 3 with 28% saying it has reduced and 33% saying it has increased. Gujarat was at number four with 19% saying it has reduced and 31% saying it has increased. Punjab, Andhra Pradesh, Telangana and Haryana were ranked at number 5,6,7 and 8 respectively, showing just marginal progress. Towards the bottom of the list, Karnataka was at number nine with 5% saying corruption in their state has reduced and 54% saying it has increased. 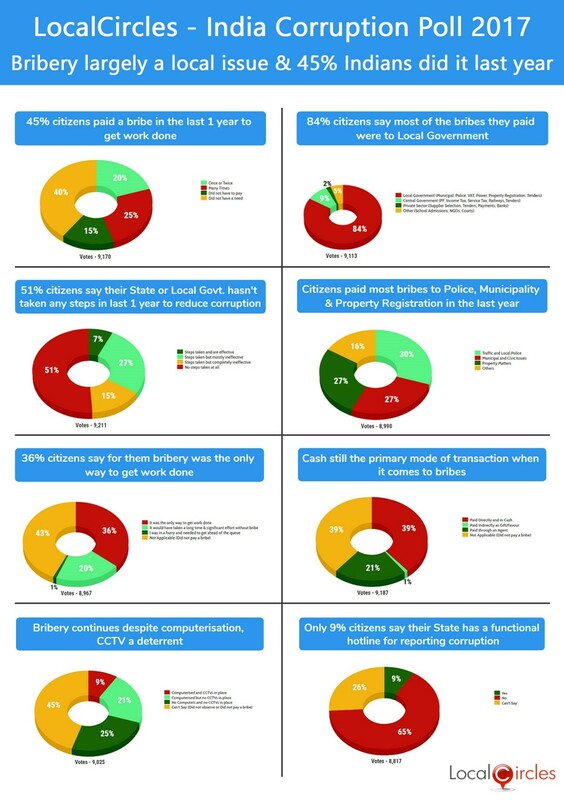 Tamil Nadu stood at the 10th spot with just 2% citizens saying corruption has reduced and 53% saying it has increased. Madhya Pradesh was the next with 14% pointing towards reduction and 71% pointing towards an increase. West Bengal was the worst performing state with just 3% citizens saying corruption in their state has reduced compared to 71% who said it has actually increased. In various structured discussions, citizens also suggested ways in which corruption in states can be reduced. These suggestions included hand-picking dedicated and honest officers and deputed in the known corrupt areas, human intervention to be minimised and e-governance to be introduced in all state government departments, reducing the discretion of the officers, especially in the revenue/sates tax/excise departments, like passport office more private players should be involved in improving government processes and judgement in corruption related cases should be fast tracked.